Made from kwila, with marine epoxy glues and stainless steel screws and fittings, these sofas are robust long-lasting all-weather pieces of furniture. Our cushions are made from quick-dry foam with canvas or outdoor upholstery fabric covers which are guaranteed for five years against rotting or fading. 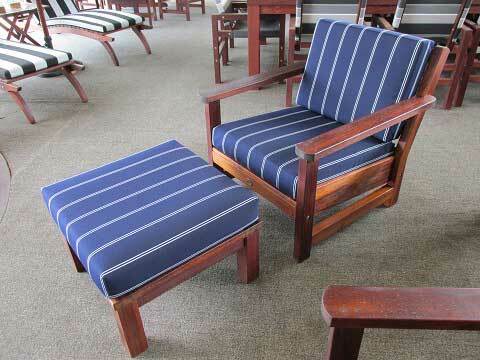 The prices below are for sofas covered in canvas or a range of plain and striped fabric. There are other fabrics available which cost a little (or a lot!) more, and if you choose one of these we will need to quote separately. Our settings allow 600mm width per seat, so the three-seater has a 1800mm long seat area, the two-seater is 1200mm, and the single chair is 600mm wide. Other prices and sizes above. Shown here with two chairs at $1050 each, and a 1500mm coffee table. Shown with a single armchair at $1050. Very comfortable and relaxing, add a tray and use it as a coffee table.